I planned for all four of my children to participate in this author/illustrator birthday celebration, but other obligations left only my youngest daughter available to come with me. Initially, I was a little disappointed that all of us wouldn't be together. Thankfully, I didn't cancel the activity. My youngest daughter and I had an amazing day. She picked all the activities -- that never happens with three older siblings expressing their opinions. I focused all my attention on her observations and comments -- this never happens since usually at least two people are talking at once. We stayed as long as we wanted -- this never happens because there is always another activity scheduled for later in the day that we need to get back for. This birthday celebration for John Manders is one that I will remember for a long time and it reminded me how important it is to spend one-on-one time with my children. John Manders is the illustrator of over thirty books for children including Where's My Mummy? by Carolyn Crimi, Goldie Socks and the Three Libearians by Jackie Mims Hopkins, and Such a Prince by Dan Bar-el. He claims he was born with a pencil in his hand, and it was people like his father, a "great drawer," who influenced John's early art. Later as a teenager, he became interested in famous comic strip artists and cartoonists like Al Capp. (Examiner). His childhood love of drawing led him to the Pittsburgh Institute of Art where he graduated in 1979. After graduation, he spent 10 years in New York doing graphic design, but moved back to Pittsburgh after "life in the big city got to be too daunting." (Pennsylvania Center for the Book). 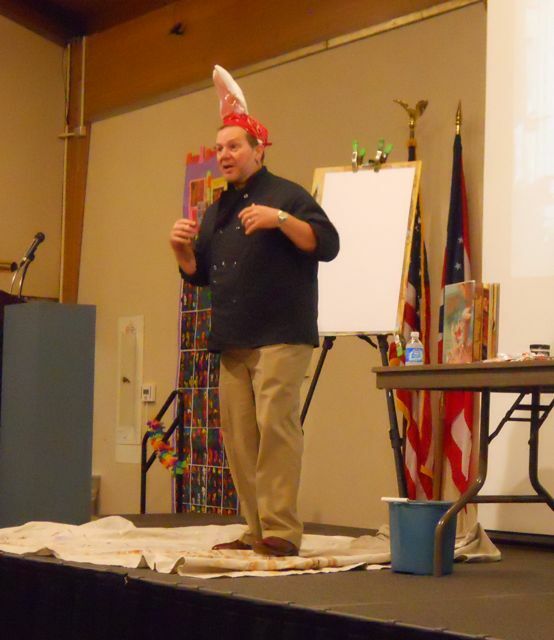 In Pittsburgh, he continued his graphic design work, taught classes, and began illustrating for children's magazines. An editor from a children's book publisher saw his magazine work and offered him his first book contract for King Snake by Wendy Shotbloom. 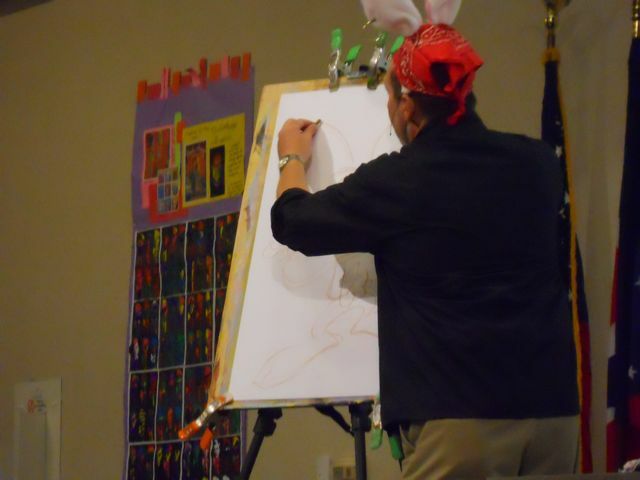 John went on to illustrate books about dinosaurs, cats, Santa Claus, a Dirt Boy, and more! In 2011, he published, The Really Awful Musicians, the first book he both wrote and illustrated. 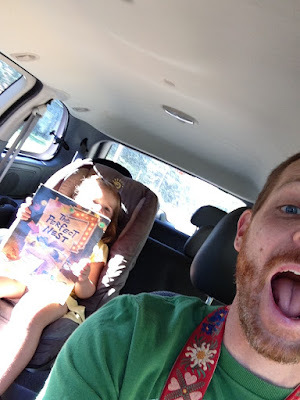 His latest book is P is for Pirate: A Pirate Alphabet by Eve Bunting (2014). In 2011, John Manders was at the Mazza Museum Summer Conference. This was the first conference I ever attended at the museum. He read Henry and the Buccaneer Bunnies and did a live painting of Henry, the main character from the story. For his presentation, John used watered-down acrylic paints. However, for his children's book illustrations he often uses gouache (his favorite medium) and Prismacolor pencils. He said, "I love to use big brushes. I use them as long as I can." 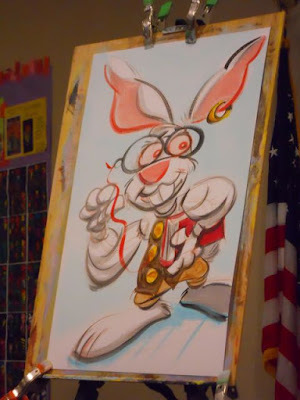 This painting of Henry is a great example of the style that you will find in John's books; fun, cartoonish, and caricature-like. 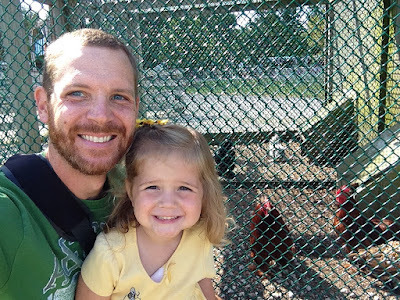 My daughter and I were headed to one of her favorite places, Lake Farmpark in Kirtland, Ohio. We took with us two books illustrated by John Manders, Prancing Dancing Lily by Marsha Diane Arnold and The Perfect Nest by Catherine Friend. Lake Farmpark would be the perfect place for us to celebrate John Manders' birthday! We left early in the morning and we were just a little bit excited for the day ahead! 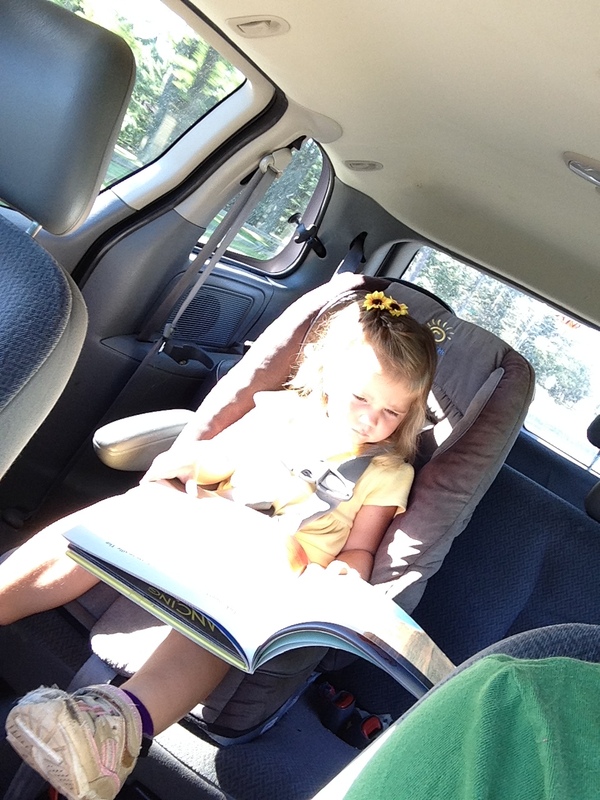 On the way, my daughter paged through The Perfect Nest. It was a special day at Lake Farmpark. 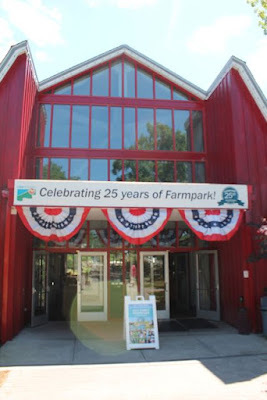 They were celebrating their 25th anniversary with free admission, many activities, and birthday cupcakes! 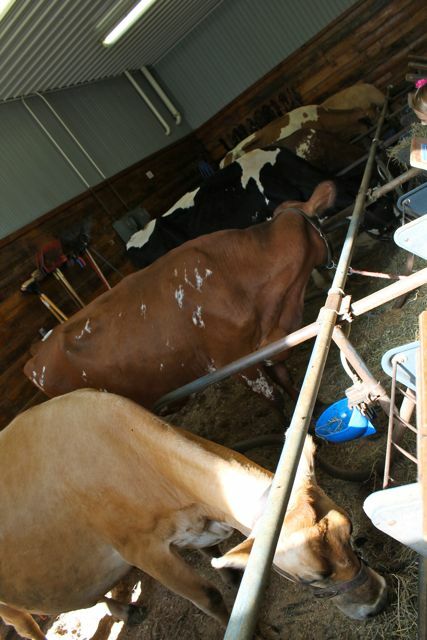 Lake Farmpark's mission is to "help our urban society understand how farmers raise food, fiber, and other products that sustain and enhance human life." 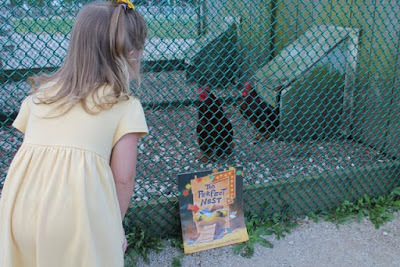 The first thing we did at Lake Farmpark was visit the Dairy Parlor to read Prancing Dancing Lily. This book is about Lily, a cow who dances all over the pasture and has a hard time walking in a line for milking time. The other cows warn her that she would never be a Bell Cow acting like that and Lily wonders what is wrong with her since she comes from a long line of prized Bell Cows. 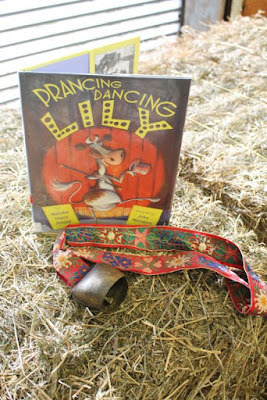 Lily leaves the farm hoping to discover a place to fit in and dances all over the world. She dances with the Rockettes. She dances on a cruise ship. She even dances as a flamenco dancer. Unfortunately, her dancing causes chaos just like it did on the farm. It wasn't until she hears conga drums in the Caribbean that Lily finds the perfect dance for her. Clang-a-lang. Clang-a-lang. I wore this cow bell at the farm for only a short time. I realized I was startling people when I overheard them saying, "I swear I heard a cow bell right behind me." 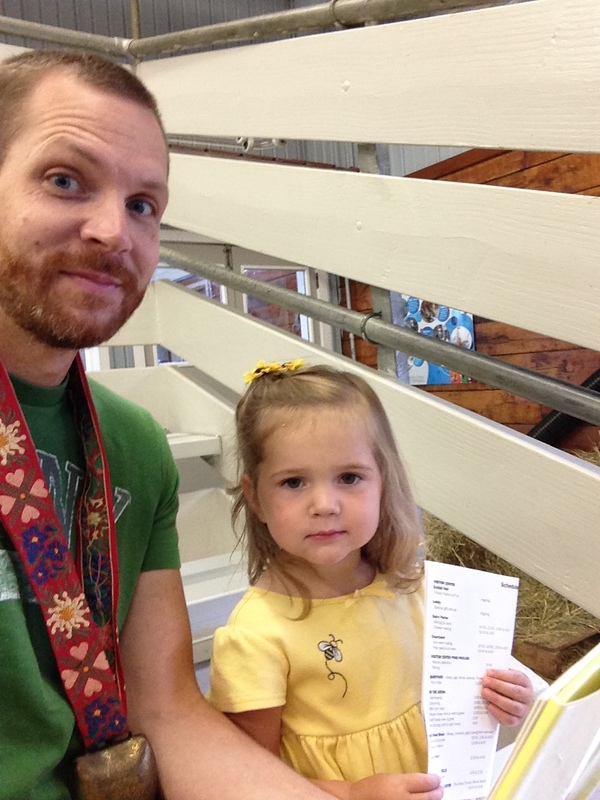 My daughter and I looked at the cows in the book. We wondered if there was a cow just like Lily in the Dairy Parlor.We found a brown and white cow at the end of the row. This cow's name was not Lily, but Deva. 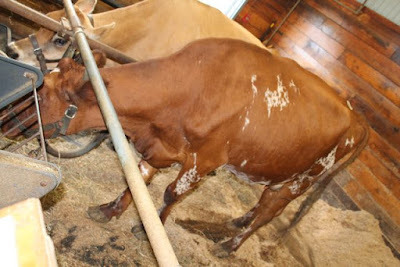 She is a Guernsey cow, which are known for their golden milk that is high in butterfat and protein. 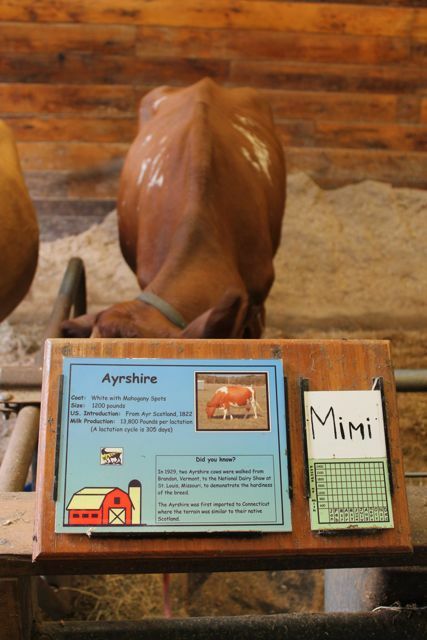 Then, we read Prancing Dancing Lily on the bleachers and noticed that the author, Marsha Diane Arnold, dedicated the book to her "father, his Ayrshire dream, and all the Highland Ayr dairy farm." I thought, Oh, no! 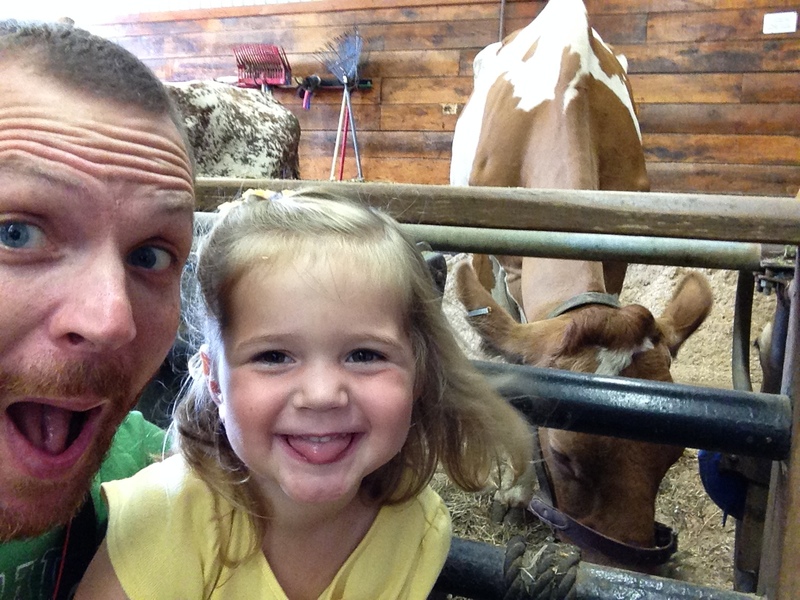 We took a selfie with the wrong kind of cow!. After finishing the book we went back down to the cows and found Mimi, an Ayrshire Cow. 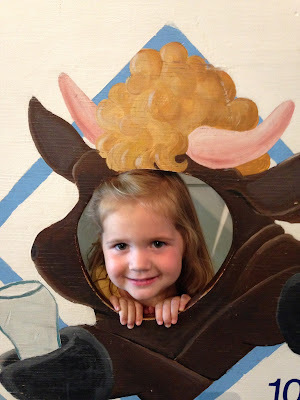 Upon closer look, Mimi looked more like the cows illustrated by John Manders in the book. Here's my little cutie of a cow!! After seeing the cows we walked to the barnyard. My daughter really wanted to find the pigs. The last time we visited Lake Farmpark my daughter dropped her mitten in the pen with the newly born piglets. A farmer had to help her get it back. I think she wanted relive that moment. We found some pigs in the barnyard, but they were really big and fat -- no piglets! One of big pigs grunted at her and she was startled. 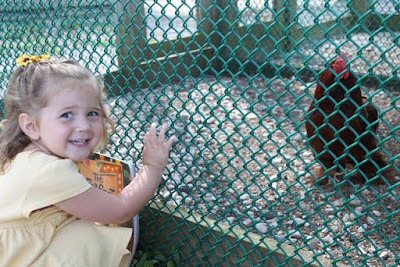 Thankfully, the chicken coop was close by -- I said, Let's go see the chickens!. She loved watching the chickens. We read The Perfect Nest right by the coop. The Perfect Nest is a story about a cat that builds the perfect nest in hopes of a chicken laying the perfect egg so he can make the perfect omelet. However, not only does a chicken lay an egg, but so does a duck and a goose. The three birds end up fighting over the perfect nest and the cat can't get to the eggs. The cat struggles but finds a way to get them to leave the eggs alone. 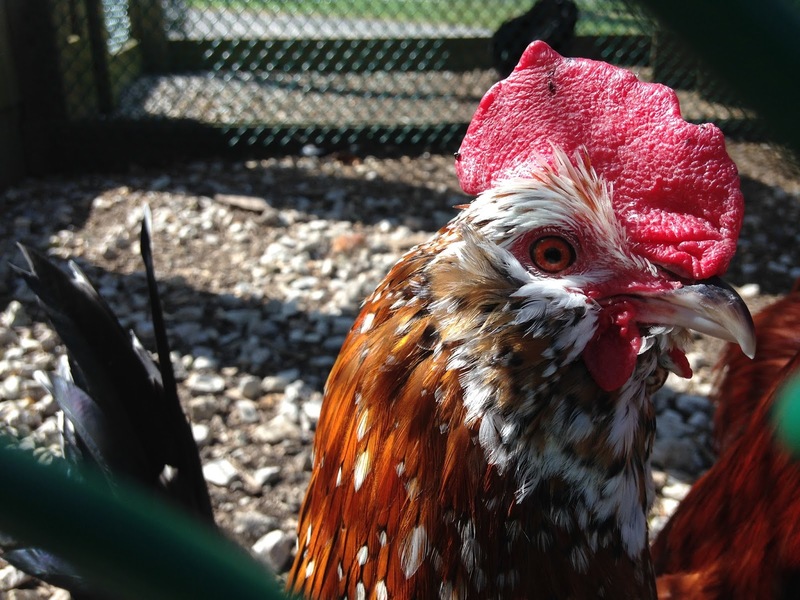 Then, he is in for a huge surprise when the eggs start to hatch and he is left with three babies to care for. Mrs. Chicken, thank you for not bawking and clucking while I was reading the book. Thank you, John Manders for illustrating two fun books that inspired us to spend the day together. It is moments like this that remind me of the reason I write this blog and celebrate author/illustrator birthdays.